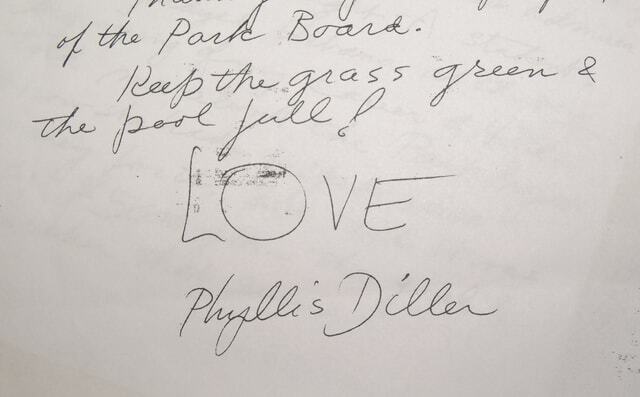 An excerpt from Phyllis Diller’s letter confirming her donation to help build City Park. 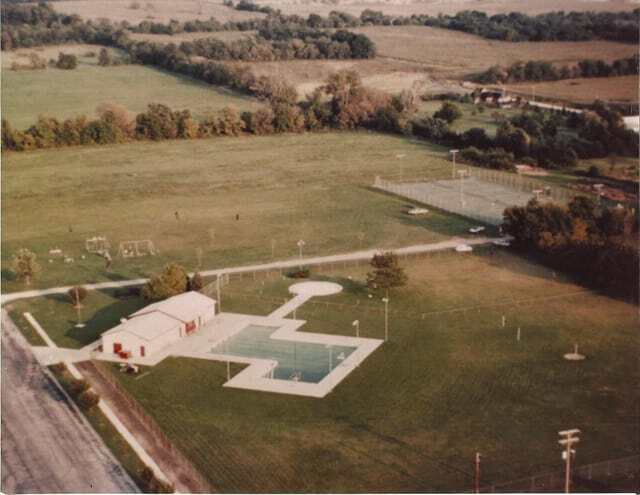 An aerial view of Melvin Miller Park after installation of the city swimming pool and tennis courts. The site of the Urbana Community Park Fest!—Melvin Miller Park—is named for the man who played a key role in making the recreational treasure possible. Appointed chairman of the Urbana Recreation Board, before Urbana had a city-owned park, Miller called a July 30, 1959, public meeting, to discuss Urbana’s need for a recreational outlet. Miller, a civic leader, philanthropist, and real estate developer, suggested three possible park sites: land owned by American Aggregates near Muzzy Lake, the Champaign County Fairgrounds and the Champaign County Children’s Home grounds. The first two were soon ruled out. Then on November 16, 1959, Miller, representing an anonymous group, successfully bid on 120.5 acres of the children’s home land. The Champaign County commissioners put the property up for auction. The home was no longer considered financially viable. Smaller parcels of the property sold at auction for substantially more than Miller’s $340-an-acre bid, which totaled $40,955. No one bid against him, an apparent sign of the public’s desire for a park. Miller and his partners optioned the land for purchase as a park. So, a nonprofit corporation was formed to accept donations to buy the land. This group included Miller, Clarence J. Brown Jr., then publisher of the Urbana Daily Citizen, Urbana solicitor Donald Dodd, Dr. Charles Bohl, Bill Stickley of the Urbana Jaycees and Hilda Smith of the Mothers Study Club. Donations from local citizens and organizations poured in, and Hilda Smith, who helped lead the campaign, secured a donation from a good friend from her school days in Lima. Smith mentioned that the campaign was $5,000 from goal. Development started with picnic tables, playground equipment and a shelter house. In 1962, the Slo Pitch Association built a lighted softball field and concession stand. Four tennis courts and another softball diamond followed. And interest kicked up to build a swimming pool, which opened in 1968. More uses for the 120 acres continue to be found—most recently a dog park, disc golf course and remote control race track. 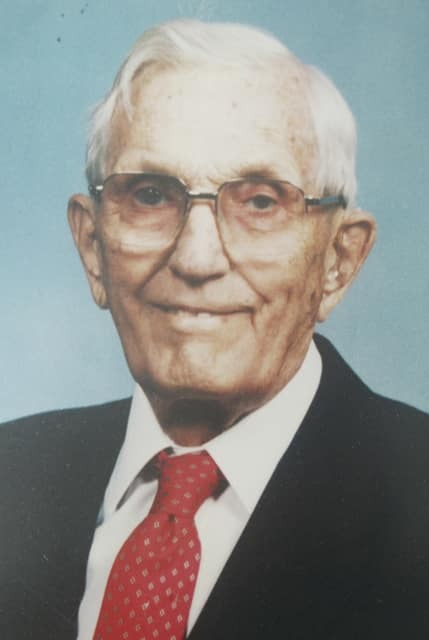 As an active, living memorial to Melvin Miller’s contributions to the Urbana community, Urbana City Council in 1993 approved an ordinance naming the city park on Childrens Home Road, Melvin Miller Park.